Population levels in a great many regional areas in Australia have been stable or slowly declining through the noughties. There is a small number of exceptions which are communities in the mining areas and some of the popular sea change communities. That’s the headline picture, the one that highlights the drift from the country to the city – and this is a global phenomenon. McKinsey estimates that across the whole world population this decade will see, for the first time in our world history, more people living in cities than in country areas. 2. There is a massive churn in people coming and going – across all age groups – which challenges the notion of ‘stability’. In most regional areas there is an exodus of young people after Year 12. This shows up clearly when you look at the population by age. And for many communities, the trend is for this gap to get both deeper (more young people are leaving) and wider (there is also a net loss of people in their late 20s and 30s as well). The chart below shows an example of the number of people in each five year age group in 2011 from Cooma-Monaro Shire in NSW. From some 740 people in the 15-19 age group, the number falls to around 460 in the 20-24 age group. 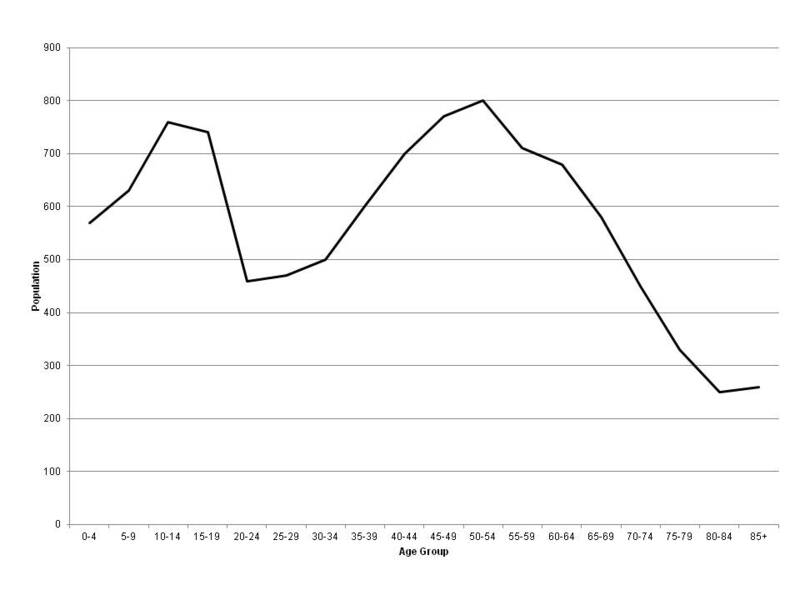 The graph below shows the net flow of people by age group for Eurobodalla Shire in NSW. 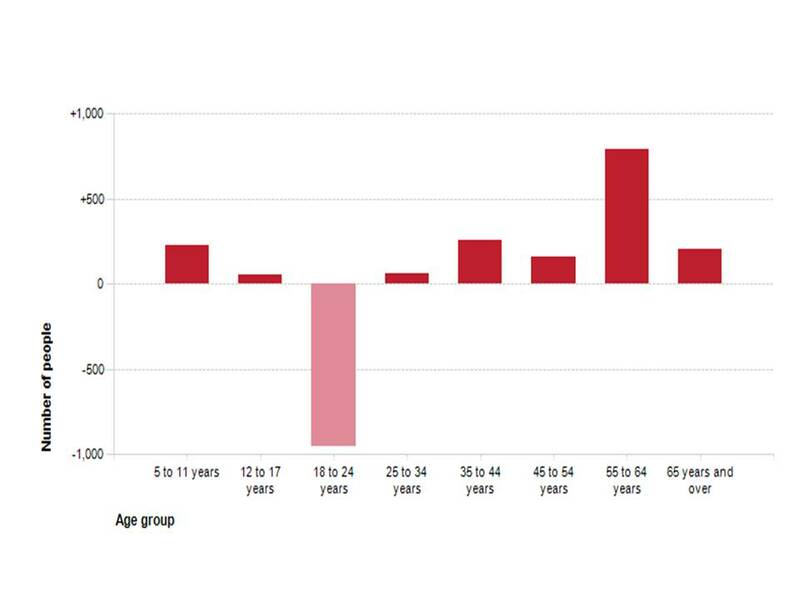 It shows a net loss of almost 1,000 people in the 18-24 age group from the Shire between 2006 and 2011, while there were net gains in all other age groups. ABS Census 2011 data, chart by id, the population experts. This loss of young people is deeply troubling for many community leaders and I often get asked ‘But what can we DO about it?” I have some thoughts on the matter, but it is much better to ask young people what they think about staying on or not. We recently did a small survey of 137 Year 10-12 students in Benalla and most (54%) were undecided about if they were going to stay in their home town or leave after finishing school – 9% said they were going to stay (one wrote “There are decent jobs to start with and a job in which I can progress”), and 37% said they were going to leave (one wrote “I don’t see any possibilities for how I could grow or progress my working life here”). Interestingly, compared with our much smaller and shorter Benalla survey there is a much higher percentage of people saying they ‘wish to leave’. And within that, the percentages are around 50-70% for most of schools surveyed, with the overall result pushed up by the responses from the three small ‘central schools’ in three small towns – with over 90% of those few students saying they will leave. I see this as a sign of the perceptions of limited work opportunities for Year 12 completers in these small towns, as the percentage wanting to leave was lower amongst students from larger towns. Community leaders often see limited higher education options in regional communities as a major driver for young people leaving, and are often lobbying to get or expand their local TAFE or university campus. The Griffith/Leeton survey puts a young person’s perspective on this, by asking “If there was a University in Griffith, would you enrol?” with just 16% saying they would, with 34% unsure and the rest convinced they would not. This suggests to me that many young people who want to leave for education want to broaden their horizons while going to university, and would leave for tertiary study if there was a good campus nearby or not. On the other hand, of course, a good campus might attract students in from other areas. There’s an excellent piece of research done for Goulburn City Council on youth mobility by Felicity O’Neill from the University of Sydney which sheds more light on different types of young people to better understand who leaves and why, and I’ve highlighted some of the most interesting findings in the last section of this post. The youth outmigration concern is not just an issue in Australia. A provocative piece for the US http://www.economicdevelopment.org site argues for letting them leave, and zeroed in on a compelling reason: Working and living in a city makes for better business owners and managers, with more exposure to new ideas and better personal and professional networks. In surveying country business owners, the author found that those who had worked elsewhere and then returned packed a bigger economic punch – owning a greater share of local businesses and employing a greater share of people than their home grown counterparts. I tend to agree with this conclusion, and I often recommend that communities don’t try and stop young people leaving, but that they focus on ensuring that their community is as vibrant and attractive as possible so that those people, or others, will choose to come and join them. I’m keen to hear readers’ thoughts and experiences on this one! 1. Creating employment or an entrepreneurial culture where businesses can be generated. This also connects to the need to provide flexible and creative training opportunities in institutions such as TAFE & schools. 2. Creating a connection with young people and the community – ‘sense of place or belonging’. This includes ensuring youth feel valued and that they have the opportunity to assist in the decision making processes about issues that affect their lives in their community. Regional population churn – who moves and why? What about the second story, that people are moving in and out of regional areas all the time? In most areas we have worked recently we have found that around 20% of 2011 residents had arrived since 2006. There is some variation, but for most regional areas the population churn rate is around 20%. This can be a lot of people even when the population total has been quite stable. In Benalla, for example, the population (people aged over 5) in 2006 was 12,540, while in 2011 it was 12,477 – an apparent loss of 63 people. And yet over the 2006 to 2011 period 2,500 newcomers arrived, a figure completely hidden if you just look at the total population numbers. We are getting better at exploring the nature of these people in terms of age, incomes, work status etc, and this will be the subject of another blog soon. It’s worth looking at as in most regions there are myths and perceptions about who the newcomers are – are they young families in subsidised housing, or older retires? The census data allows us to test these for reality. For this blog, the concern is that there are large numbers of people moving into and out of regional areas. What’s this about? Most of the communities I’ve worked with lately are most interested in getting more people to move in, and haven’t really considered the flow out. I’ll start by summarising some good recent research on who’s moving into regional areas and why. The WA Department of Regional Development published the results of its huge “Living in the Regions” survey in January 2014. It’s a massive undertaking, with over 10,000 respondents. The survey found that 31% of regional residents were born in the area in which they currently live. A total of 55% had mostly lived in the regions before the age of 15 years (this group comprises those who had stayed on and those who had returned or moved to another regional area) and 27% had moved to the regions from Perth or another capital city. So a lot of regional residents have always or previously lived in a regional area – only 27% were city escapees. • To be closer to their family (40%). Some of these are things that communities can influence indirectly (such as work opportunities, cost of living, activities) but many are quite personal. Analysis shows that the longer people live in a regional area the more likely they are to stay on – which supports the notion from the Goulburn study (below) that some people are inherently more mobile while others tend to stay put. If this is the case than a good strategy for bulking up your town’s population is to see if you can keep this mobile cohort just for another year or two – don’t expect them to stay forever. A recent discussion piece by the Regional Australia Institute (www.rai.org.au) on “Regional Returners” gathered the numbers on people who moved to regional areas, and found that there is a net gain to regional areas of people aged from their late 20s to their early 40s. . They also profiled a few case studies, which highlighted the lifestyle benefits of living in the regions as seen by the group of people that have chosen to live in the regions. Yes, it is a bit circular but still quite valid. “At the same time, many rural counties experienced gains in the 30-49 age cohort. Further examination of this rural demographic found that this cohort was choosing to move to rural areas for a better quality of life. This we have termed a “brain gain” because, as we examine the demographics of the 30‐49 year old cohort, we see that those migrating to rural areas are in their early/mid‐career; they bring significant education, skills and connections to people and resources in other areas. Again the lifestyle aspects of country living emerge as a major driver. Research done on people in their early 20s who had grown up in Goulburn identified some differences in the characteristics of those who stayed in Goulburn (stayers), who left and were still living elsewhere (leavers) and who had lived elsewhere and then returned (returners). In particular, there are signs that the leavers had little intention of returning – they had more moves under their belts, were not living with family and had careers for which there were few jobs in Goulburn. Though fewer of the leavers were married and so they might not yet have reached the stage of wanting to ‘settle down’ and move ‘back home’. The findings from the research are that improving social and cultural capital alone will not stop people leaving, though it might encourage some to return. Family connections are a major driver of returning, and to achieve that it is important that there are suitable job opportunities to come back to. But leavers tend to have careers in fields where there is little employment in Goulburn. And for the young returners, there is little self employment or ‘buying themselves a business’ as they are still looking to be employed by others. Interestingly the research also looks into electronic media as a tool for keeping engaged with Goulburn and found that the current generation of leavers still feel well connected with the town. So what does this all mean for economic development practitioners? It’s clear that many young people want to get away from their regional home, and that while some will come back others will keep wandering. The smaller the community the more likely it is that young people will go. The community can’t stop them going, and in fact it seems that those who go and come back bring tangible benefits for the community’s long term future. So the message here is let them go, and focus on ensuring the community is vibrant enough to attract them back. We know that there is a lot of mobility in people of ‘prime working age’, and we know that some of these people will move on regardless of the quality of the work or community on offer. But we also know that there is another segment of this ‘market’ which is looking for a lifestyle – drawn primarily by good social infrastructure and, most likely, by some historical or familial connection. These people have plenty of options of places to move to, so play up the known drivers unique to your town – those familial and historical connections. Don’t market your town on what everyone else has too – a great lifestyle, a friendly and safe community and plenty of clean air. These are indeed selling points, but they are certainly not unique. Can you address any social infrastructure gaps that your community might have that might contribute to people moving on – are there good facilities and opportunities in health and education? And is there a vibrant business community? Shopping keeps coming up as an attractor – and this comes down to the entrepreneurial skills and drive of your mainstreet business operators. And is there a good range of jobs – for the middle aged movers and for their kids? Lifestyle is valuable, but without a job to provide income, the lifestyle dream may well turn sour – as many of the newcomers to Trundle involved in the tree change TV documentary found. For the mobile group that just keeps moving, it might help to deliberately connect them up with their peers to build their social capital. And even if they don’t stay on forever, they might stay another year or two, which will have a big positive net impact on the community. Of course the best way to ensure these mobile ones stay is to get them married to a local … but that’s another story! Houston, Lani (2004) “Investigating the retention and attraction of youth in rural communities”, Churchill Fellowship Project Report. This entry was posted in Transitions; turnaround town; rural revival; economic adaptation on June 10, 2014 by kimhoughton.